This is exactly the kind of idea you need on a January evening or weekend: easy, relaxing, fun and it is going to bring a pop of color to the dullness of winter. 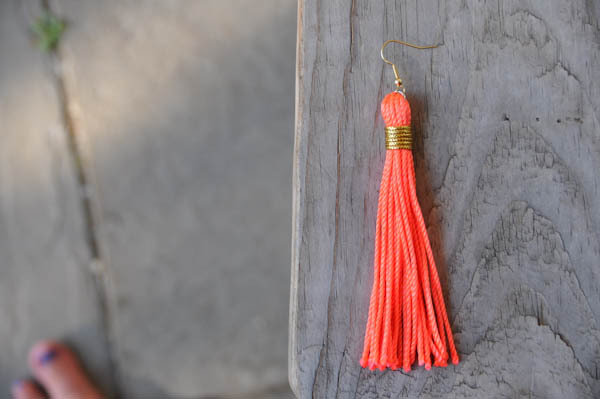 A lovely tutorial that I’ve found on Blog A La Carte to make yourself a pair of stunning and colorful earrings. I adore to work on a project that can be started and finished off in minutes: nothing compares to the satisfaction of having something new to wear made with your own two hands and in such little time. So without further ado, grab some bright embroidery thread (peach or light blue anyone? Don’t know about you guys, but during winter I really do need a colourful pick-me-up) and get your hands to work!